On Memorial Day 2014, Germanna family members were at the Germanna Foundation Memorial Garden to honor the day and those it commemorates. The President of the Germanna Foundation read a representative selection of names of members of the Armed Forces who risked their lives defending our freedom and are now remembered by the present generation, and Germanna descendants rung the bell that has rung many times now to celebrate and remember. 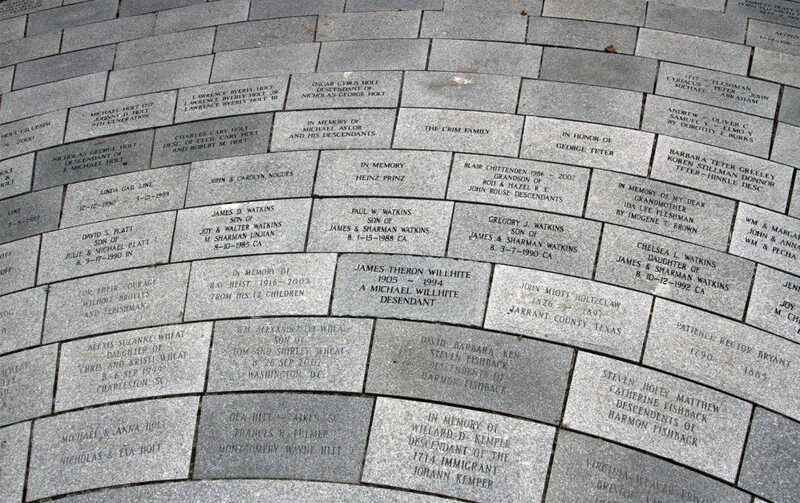 Some of the people remembered in the Memorial Garden gave their lives in the defense of the United States. Some paver stones were given to celebrate the birth of child. Others to honor a graduation or a retirement. There are even a few family trees in stone, where a visitor could hop from one generation to the next, all the way across the Atlantic Ocean. If you would like to honor or remember someone in your family in this way, go to the Memorial Garden page to find out different ways you can order a stone paver to be placed in the garden. Each stone that is engraved is dedicated at the next Germanna Foundation annual Conference and Reunion.